Based the the level of service I sometimes get, I’ve been convinced that many of the restaurants I frequent here in the UK don’t actually exist until I get there. Apparently I (may be partially) right! As my wife is probably tired of hearing from me… it honestly feels like sometimes that as I walk in the front door of a place, the waiters are walking in through the back for the first time. It’s not that they are not nice, they just often seem so… lost. It’s not even bad service per se, so much as if though they’ve just now memorized the types of things that they should say and ask and so are just going from a script. Perhaps there are crucial aspects of ordering food in Great Britain that I haven’t yet grasped. The hilarious part is that I am probably one of the least picky people food-wise (you could give me the completely wrong order and unless it turns out to be pile of mushrooms covered in mayo, odds are I won’t send it back) but for some reason I continuously find myself amazed by the restaurant service. In the States, the restaurant service is really based on tips, so they have huge personal incentive to give excellent service. While “service charges” are becoming more common, in general it’s still only 10% and gets distributed to the whole staff as far as I know. I wouldn’t be surprised if this is a large component of the whole situation… they can go on auto-pilot and it won’t affect them much either way financially. 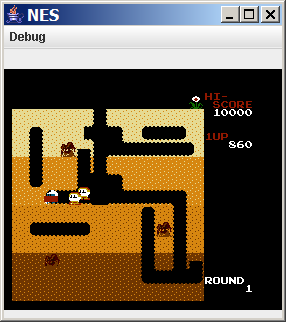 Once I got the LWJGL (specifically using the JInput stuff built into it), it only took me about 30 minutes to get the emulator to work with a gamepad controller! I just set up a thread that continously hits Controller.poll() to find out what’s currently being pressed. I will probably slow it down and only poll after the controller has been “strobed” by the game (by writing a 1 to $4016). I bought a dual PS2->USB adapter from Amazon and my only complaint is that both controllers show up with the same name. I just hardcoded the code to use the second one, but I’ll add a configuration screen for that. They show up as joysticks, and the digital pad ends up mapping to the “Point of View” hat. Thankfully it maps fairly well, with discreet values of 0,-1.0 and 1.0. It’s so much more fun playing Mario with a controller and not going ghetto-style with the keyboard. Of course since the emulator is still glitchy, when my wife was playing on World 4-1, she was getting killed by invisible tube plants. I don’t really have any idea why it’s happening, as far as I know the sprite rendering is working quite well… so the only thing I can think of is that there are some off-screen sprites that the code things are visible and so get added into the 8-sprite-per-line limit when they are in fact invisible. And that could be happening because there’s a setting to not draw the left/right 8 pixels on the screen and I’m completely ignoring that currently. Businesses that don’t accept debit or credit cards but will happily point you to the $3 a transaction ATM on the premises. Things are meant to”Better serving me” shouldn’t annoy me. Apparently I’m not alone. I will fully acknowledge that when it comes to fashion, I’m not what you’d call “an expert” or “at all knowledgeable” so these are clearly subjective personal opinions and not objective statements of fact. I’ve asked my wife multiple times “do people actually set out to look like idiots?” with the response being obviously “no, it’s trendy and they like it.” I’m not so sure about the latter, but no doubt the former is true. My theory is that the really cool people do wake up every once in a while and ask themselves “What ridiculous look can I try and actually have other people follow it?” Those people, my friend, are the true geniuses (genii?). 0x42 is not the answer! Quick update. 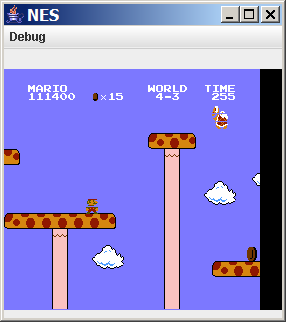 Finally managed to get Super Mario Brothers to start on the NES emulator without having cheat in the debugger. Turns out that I had misread some documentation and so I was sending hex 0x42 to represented the unconnected controller #2. After running through the debugger over and over I’m pretty sure it was getting interpreted as every key being pressed on that second controller. In any case, it was definitely interfering with the START key detection (since the actual game played fine once started). Moral of the story is the 42 is not always the answer especially if, as a co-worker said today, you’re not asking the right question. 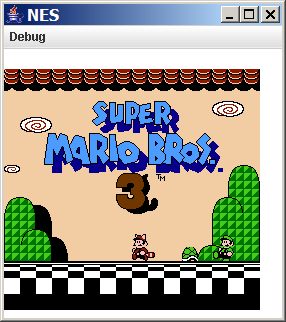 So I managed to find a disassembly of Super Mario Brothers 1 as part of my attempts to figure out why I couldn’t start the game. I still don’t know why it doesn’t work, but I was able to find a spot where I could trick it into thinking that I was past the demo mode. So I’m probably the first person to have every controlled Mario while the “1 Player or 2 Player” menu was still on the screen. I’m hoping to use it to find out what’s wrong with the one I have. Interestingly, when I use Nestopia, it warns that the ROM is bad and ends up starting on a different level (0-1 instead of 1-1). That could be part of the problem perhaps? But whatever, I got to actually play! And I couldn’t wait to shoot fire, one of the more fun things to do in Mario. The weird color on the blocks is because they actually flash and the screenshot caught it at a weird time. I cannot seem to get past this point. Every time I jump I just hit my head on the tall “tree” and fall down. *sigh* Good thing I can give myself as many lives as I want! 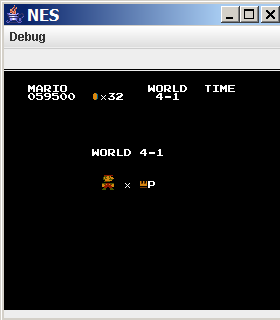 The emulator actually runs a little too fast, so the time counts down pretty quick, but not double time thankfully. 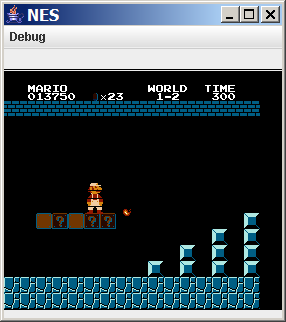 Did a couple of hours of hacking on the NES emulator and managed to get the color to (mostly) look right. I had multiple little issues in the way I was handling the Name Table Attributes and palettes. I had misunderstood the documentation and that there was only one 16 byte set of palette data (that was mirrored) but there is actually 2 16-byte ones (which gets mirrored a few times). This allows for a separate set of background and sprite palettes. However, even after fixing that, I still had whacky reddish clouds! 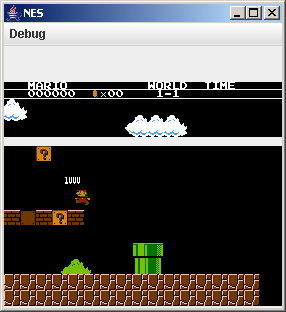 Thankfully that was a simple fix, I had swapped the two blocks of memory and was using the background Attribute Table as the sprite’s and vice versa. Naturally as is the case with this project, things still aren’t quite right. Namely the screen should be blue, rather than black, and there are lines where the sprites aren’t being fully read. In addition, the plant that is supposed to come out one of the tubes doesn’t show up. No doubt I’m making this project harder than it necessarily needs to be, but I’m having fun doing it (when I actually work on it). I’m always getting distracted with other little hobby projects, especially when the “going gets rough”. I’ve been playing around with the proverbial Ant simulation that is always popular among us geeks… it’s amazing to watch emergent behavior come out of simple rules. Of course, mine isn’t working quite right.